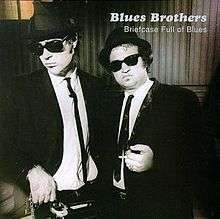 Briefcase Full of Blues is the debut album by The Blues Brothers, released on November 28, 1978, by Atlantic Records. It was recorded live on September 9, 1978 at the Universal Amphitheater in Los Angeles, when the band opened for comedian Steve Martin. The album consists of covers of blues and soul songs from the 1950s to 1970s. The album reached number one on the Billboard 200 and went double platinum; according to Blues Brothers member Dan Aykroyd, the album has sold 3.5 million copies in all. It is among the highest-selling blues albums of all time. Two singles were released from the album: "Rubber Biscuit", which reached number 37 on the Billboard Hot 100, and "Soul Man", which reached number 14. Originally recorded in 1955 by Big Joe Turner. Elwood Blues – Backing vocals, harmonica, lead vocals on "Rubber Biscuit"
1 2 Gatchet, Roger (18 May 2007). "Still on a Mission from God: interview with Dan Aykroyd". AustinSound.